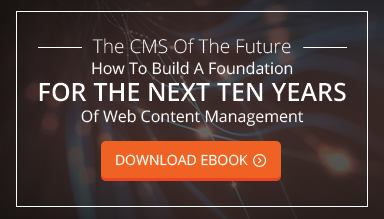 What’s In Store For The Future Of Web Content Management? NP GroupBlogTechnologyWhat’s In Store For The Future Of Web Content Management? Using a content management system today is fairly simple once you take the time to become acquainted with the platform. But what if I told you it could be even easier, and that using a CMS could actually fit into your business model instead of the other way around? The essence of a content management system is simplicity. It allows for administrators to add, edit, and organize content on the Web. While that rings true for the physical act of using a platform, it isn’t always the case when it comes to fitting into the workflow of your business. When you have to create a system around your CMS, you are not benefiting from your technology in the way that you should be. Although today’s CMS platforms are able to distribute content online as intended, there is a better way. Opting to have a custom CMS or a decoupled CMS created is a smart choice because it’s the direction the development industry is headed. There are specific businesses that benefit even more from these types of platforms like publication, e-commerce, and SAAS platform websites. Here are some of the benefits of choosing a CMS platform that will last well into the future. Many agencies work with off-the-shelf systems that they can easily install, which is perpetuating an online world of “sameness”. These agencies usually just take existing themes and modify them. This is the only economic model that makes sense for them since they have to do so many projects to justify being in business. True agencies craft custom, creative solutions that solve problems and add innovation into an otherwise mundane world. And to truly get that right, you have to remove impediments. In this case, a custom decoupled CMS makes it easy for creative professionals to build solutions specifically for a client and their challenges, unrestricted by the capabilities of a platform. This may be one of the largest advantages of a custom system: freedom. Today, content isn’t just pages, but also rich media like audio, video, and images, or other in-depth materials. The most effective way to develop your CMS is to identify your organization’s true content types. If you are a manufacturer, your products make up a lot of your content. If you are a publication, your stories or videos are the content you are distributing. Your business and your content are different from other organizations, so you must have a platform that fits your medium, content, and workflows. With a custom system, you can focus beyond publishing content. You can focus on the phases of creation. If you’re creating video content, it’s possible to have your publishing platform also help you produce it. This means creating a platform to assist in everything from storyboarding to delivery within your organization. No longer do you have to utilize a system of internal documents, folders, and other messy workflows—you can build them right into your CMS and control access for the people creating and sharing the content. This is an often-overlooked but essential component of a headless architecture. You have complete creative control over the look and feel of the admin portion of your framework. This means you can either custom design the user experience for your administrators, or you can choose from off-the-shelf user interfaces, which allows you to quickly develop workflows and administrative controls. Many decoupled projects feature bootstrap-powered themes, which are easily switched and changed later if necessary. There are no constraints on the admin portal as there are with other enterprise CMS platforms or open-source frameworks available today. With today’s technology managing content on the Web can be as simple or difficult as you choose to make it. You can continue to force your workflows into a system that doesn’t meet your needs 100% and keep just getting by, or you can go custom and create your own system designed to fit your business, increasing efficiency and preparing you for the future both in managing content and growing your business.